Have you heard of “Big Night”? 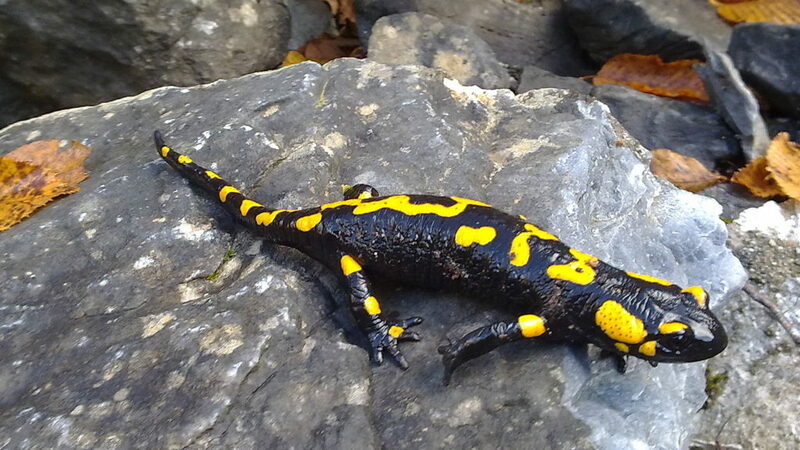 If it sounds like a fancy party or event, you’re right, it is—for spotted salamanders and other amphibians. This annual event is a great way to introduce kids to the ecosystems that thrive in their own backyards, local forests, and natural areas. It’s also a great opportunity to spark the interest of young scientists through hands-on exploration of a weird and wonderful biologic event. “Big Night” is what scientists and ecologists call the spring migration of spotted salamanders and other species that reproduce in vernal pools—the ephemeral, shallow bodies of water of spring. One night (or more often, several nights) every year, usually in late March or early April after the first warm rain of the season, salamanders and frogs migrate together from their overwintering habitats to nearby vernal pools. They cross roads in hordes, marching toward their destination in an awe-inspiring parade. Introducing students to the ecosystems of vernal pools is fun and there are a lot of resources out there to help you get the most out of your efforts. Like any scientific exploration, it’s always good to start with the questions: “What is a vernal pool? Who lives there? Where can I find one? Why are they important?” If you’re still buried under deep snow like I am in Vermont, now is a great time to study up indoors. And when the snow finally melts, you’ll be ready to head out with your facts and flashlights to experience Big Night together. This book by wildlife biologist and photographer Doug Weschler is a beautiful and detailed look at the complex ecosystem of a vernal pool. Through photography, graphics, and text, the book explores the life of one pool in Delaware as it cycles through each of the four seasons. Frog Heaven not only looks at the individual species that rely on and thrive in vernal pools, but also shows their interconnectedness and the importance of protecting the these special places. For younger readers, Big Night for Salamanders is an illustrated account of Big Night through the eyes of one family and their young son, Evan. Together, the family go out with their flashlights to watch—and help—the amphibians cross the road. The book intersperses Evan’s experience with facts about salamanders, providing both solid science and a kid-friendly storyline. The back matter includes a more detailed look at the salamander’s life cycle, Big Night, and vernal pools. This pictorial field guide, produced in a joint effort by the Massachusetts Natural Heritage & Endangered Species Program and the Vernal Pool Association, was produced with the goal of helping students identify the vertebrates and invertebrates that make their home in vernal pools. Though the guide is specific to Massachusetts, many of the species it covers are found in vernal pools all over New England. You can read the book via archive.org. The Vernal Pool Association website itself is a treasure trove of educational resources. From the graphic adventures of salamander “Vern L. Poole,” “A Year in the Life of a Spotted Salamander”, to deeper dives into the ecology of specific vernal pool residents—the wood frog, salamanders, the fairy shrimp, and invertebrates—it’s a great place to find source material for your lessons. The Association also keeps a blog and a Facebook page. Once you’re ready to head out to your local vernal pool to do some hands-on learning, here are a few ideas to get your kids observing, collecting data, and answering questions through their own experience. 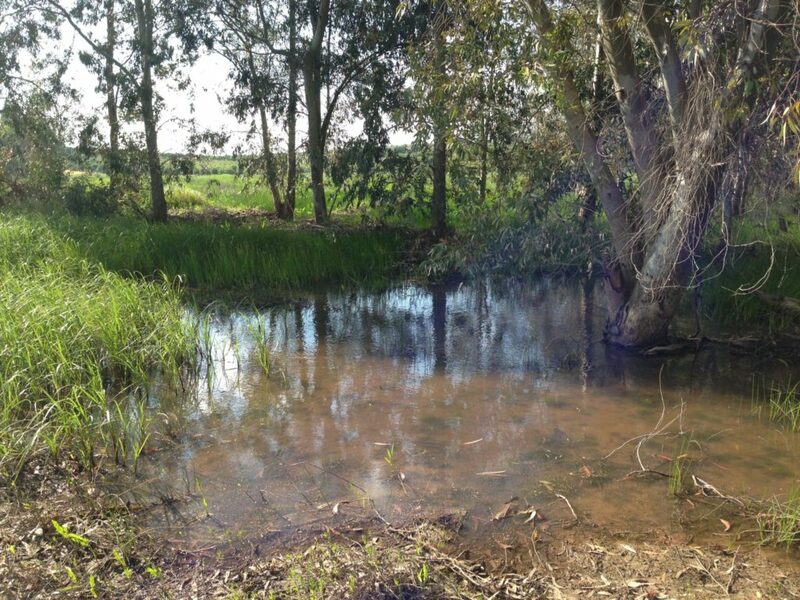 Go find a vernal pool in your community! Once you find “your” vernal pool, students can measure and map its size and shape, visit it daily or weekly and record observations on a small sample site or the whole pool—what is the temperature and weather; what animals and plants do you see; has the pool changed in size or shape over time? Each student might embark on a more detailed study of one vernal pool resident, or “adopt” an amphibian to learn about. The Harvard Forest has a good round-up of vernal pool lesson plans for a variety of age groups and skill levels. Connect with a local ecologist or wildlife biologist. Many state and local Fish and Wildlife Departments do outreach and educational programs and would love to take your students on a field trip to study a vernal pool. Environmentally focused non-profit organizations are another good option to connect students with experts in the field and add a layer of real-world experience to your studies. Of course, you can’t miss the experience of Big Night itself! 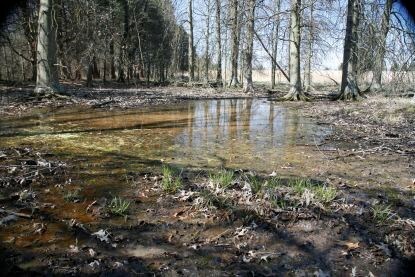 If you have a vernal pool nearby, monitor the temperatures in late spring and early winter until it gets close to 40 degrees. On the first rainy night after that, head out with your flashlights to the road nearest the vernal pool. See if you can spot the parade of spotted salamanders!